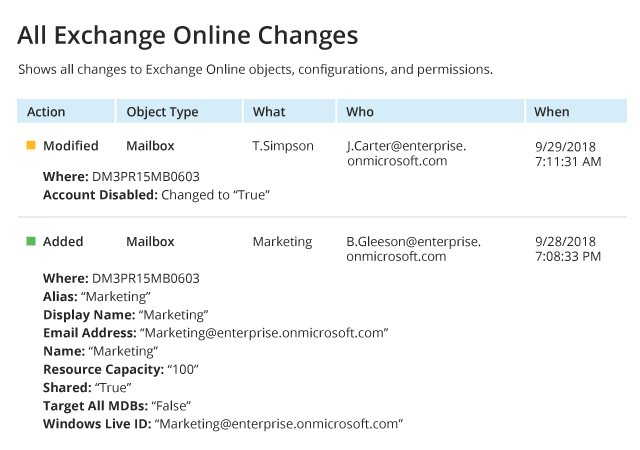 Tracking changes is a key part of Office 365 security monitoring. 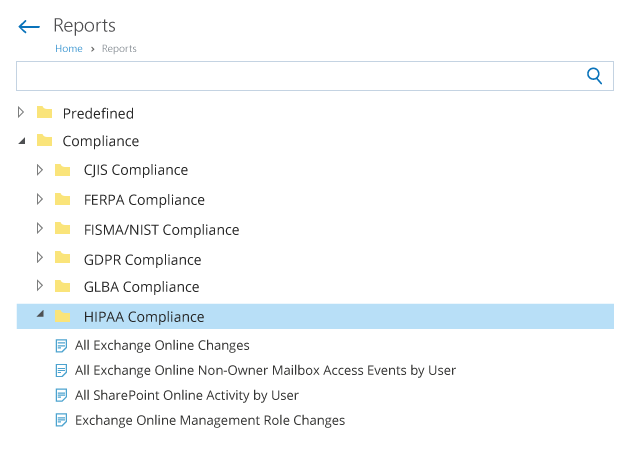 With Netwrix Auditor, you get complete visibility into critical changes across your Office 365 environment, including activities in Exchange Online, SharePoint Online and OneDrive for Business. 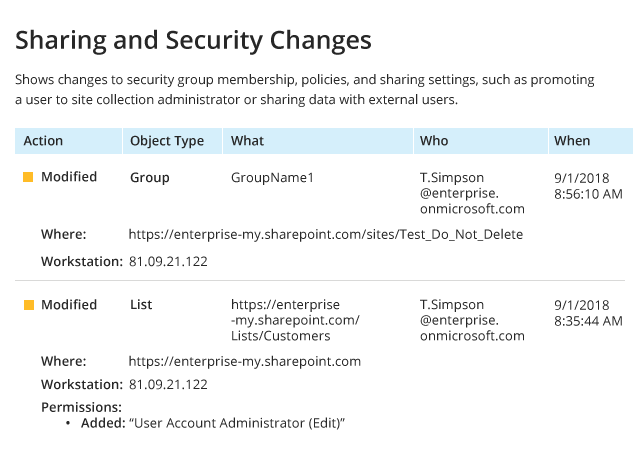 For example, you can track unauthorized changes to security group membership, policies, sharing settings, content and mail users, and remediate improper changes before they cause security breaches or affect your Office 365 users. If you don’t perform regular data access monitoring in your Office 365 cloud environment, someone might view or download a file that they are not supposed to see and you won’t find out about the violation. 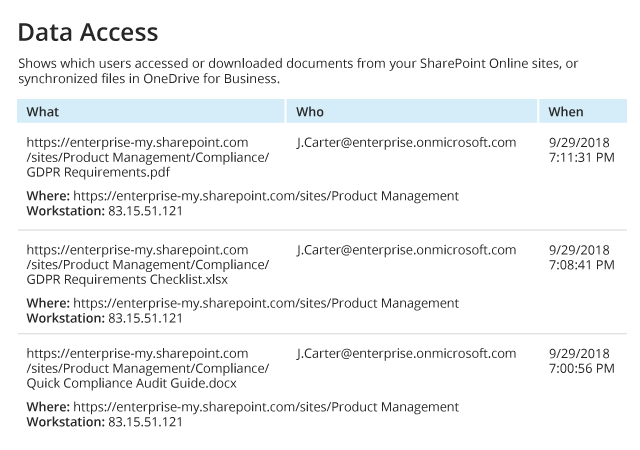 Netwrix Auditor makes it easy to regularly review which users accessed or downloaded documents from your SharePoint Online sites or synchronized files in OneDrive for Business so you can make sure that no unauthorized access attempt to critical data slips under your radar and strengthen your data security. One of the most important steps for ensuring Office 365 security is to monitor non-owner mailbox access attempts. If Office 365 admins skip this step, sooner or later they’ll miss unauthorized activity. 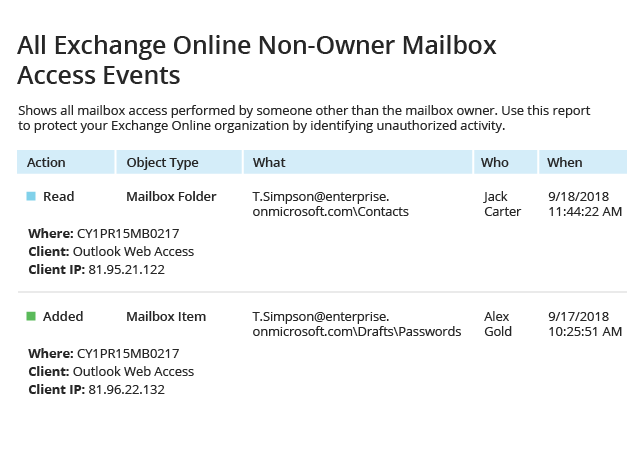 Netwrix Auditor delivers information about non-owner access to Exchange Online mailboxes, logging the source client and IP address for each event, so you can spot unauthorized activity in a timely manner and hold individuals accountable for their actions. For security and compliance purposes, you need to know what kinds of sensitive information you store and the level of protection around it. 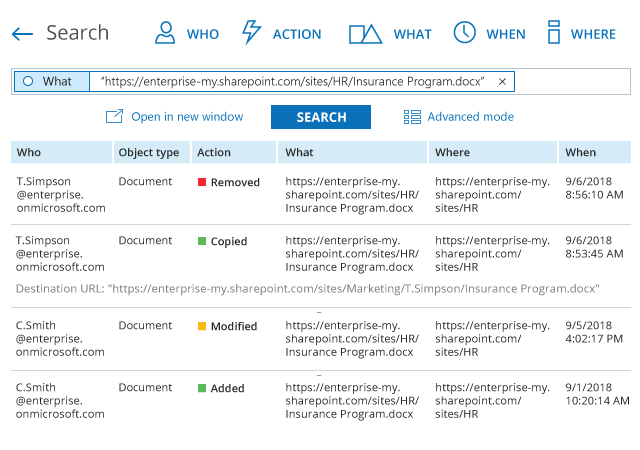 Netwrix Auditor’s Data Discovery and Classification can identify sensitive data stored on your SharePoint Online and OneDrive for Business so you can make sure that no critical file is stored outside of a secure location in violation of corporate security controls and regulatory standards. You need to constantly stay vigilant to keep your sensitive Microsoft Office 365 data secure. 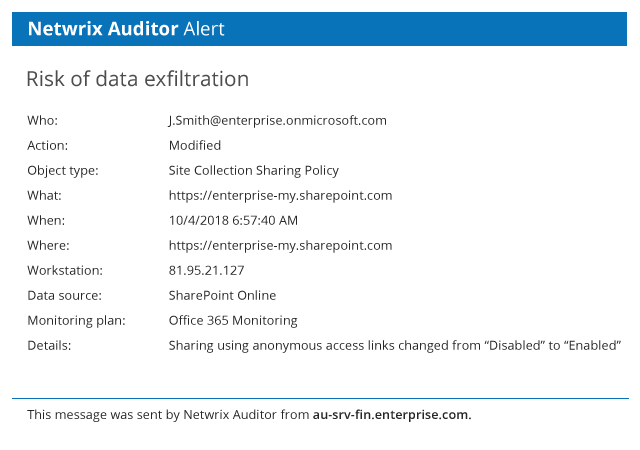 Netwrix Auditor’s alerts notify you about critical activity across your Office 365 environment, such as changes to content sharing policies and mass data removal, so you can identify potential threats faster and prevent data loss. To secure your Office 365 cloud from more sophisticated threats, it’s crucial to have something up your sleeve that is more advanced than alerts. Netwrix Auditor helps you spot malicious insiders and compromised accounts by providing a single view of abnormal user activity across all audited systems, along with each user’s cumulative risk score. Without a proper tool, it may not be simple to spot subtle indicators of threats, like someone being active outside business hours or accessing data that they almost never accessed before. 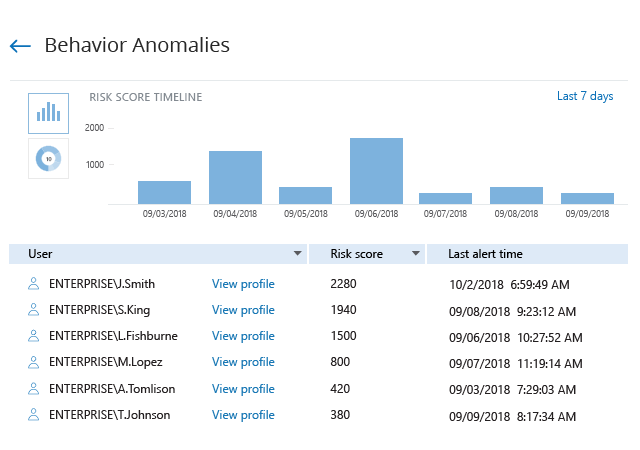 With User Behavior and Blind Spot Analysis reports, you can quickly identify these subtle indicators of threats and investigate them to harden the security of your cloud Microsoft Office 365 applications. 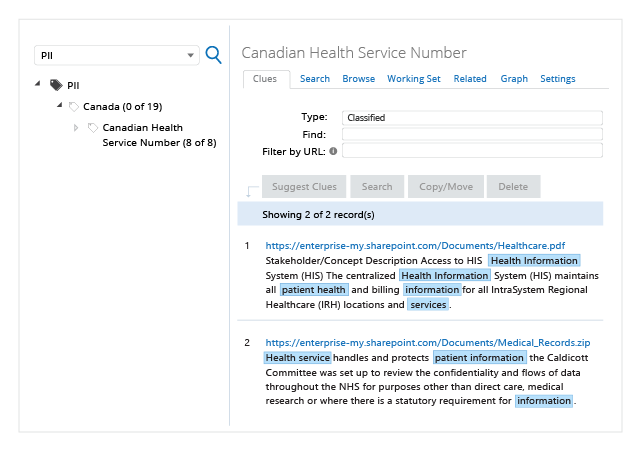 Whenever you need to investigate a security incident or figure out what brought your cloud services down, Netwrix Auditor’s Interactive Search can help you quickly find the exact piece of information you need. 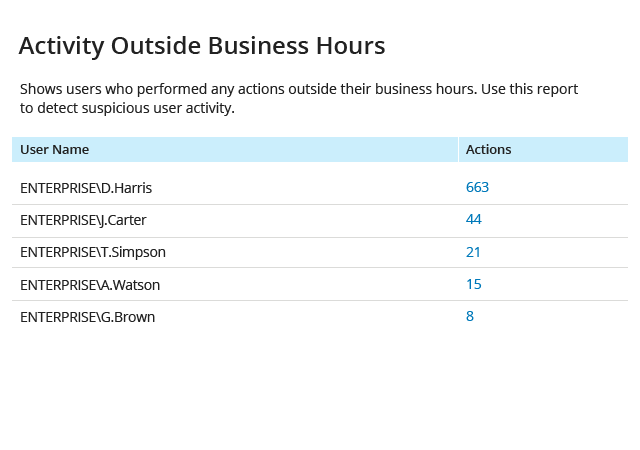 Plus, you can create custom reports based on your search criteria to stay aware of similar incidents in the future. Without a single-pane-of-glass view, you might miss an important piece of information while taking care of day-to-day routines. 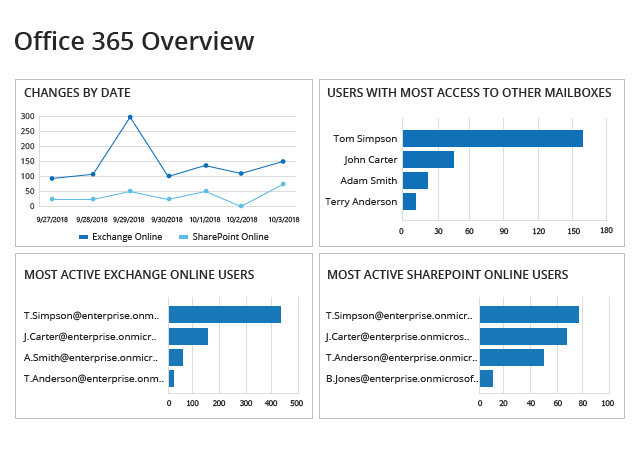 Netwrix Auditor’s overview dashboard highlights unusual spikes in user activity and delivers information about changes by date, users with the most access to other mailboxes, and the most active Exchange Online and SharePoint Online users. Native Office 365 tools provide no predefined compliance reports, which makes it hard to demonstrate to auditors that you do everything possible to keep your Office 365 secure. Netwrix Auditor makes this task simple with out-of-the-box compliance reports tailored to PCI DSS, HIPAA, GDPR, SOX, GLBA, FISMA/NIST and other regulatory standards, so you can pass audits with far less time and effort. Not every auditing solution can be easily integrated into your environment. Netwrix Auditor has a RESTful API that lets you integrate it with other security, compliance and IT automation tools so you can expand visibility to other systems and have your entire audit trail available from a single place. To save you time on responding manually to common and anticipated incidents, Netwrix Auditor empowers you to automate response to such incidents by embedding scripts in alerts. This ensures a prompt response without distracting you from more important tasks. Many compliance standards require organizations to store their audit logs far longer than Microsoft Office 365 can. With Netwrix Auditor, you can store your audit trail in a two-tiered (file-based + SQL database), cost-effective storage for more than 10 years and easily access the archived data for historic reviews and inquiries. Many organizations have a complex infrastructure and need multiple users to have different level of access to the audit data and configuration settings. Netwrix Auditor enables you to granularly assign the appropriate access rights to each IT administration and business team in accordance with the least-privilege principle. Learn how Netwrix Auditor for Office 365 can help you detect data insider threats, pass compliance audits with less effort and expense, and increase the productivity of your IT team. 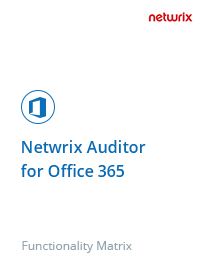 Quickly review the functionality of Netwrix Auditor for Office 365 in a format that facilitates comparing it with your requirements.